First, as a FREE SERVICE KitchenSync will provide a kitchen design layout including plans, elevations and pricing using one of our brand name semi-custom cabinetry lines including KraftMaid/Venicia Cabinetry and Ultracraft Co.. After you meet to review the layout and estimate, should you wish to continue the design process, we ask for a $200.00 commitment fee which is later fully deducted from the final price of the cabinets. 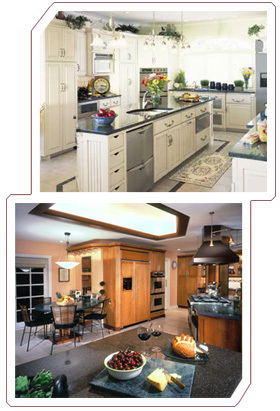 Second, KitchenSync also offers custom cabinets from Crystal Cabinets at very competitive prices. The same initial offer of free plans and pricing applies to these lines too, although we ask for a $400.00 commitment fee to continue to the next design phase since projects of this nature call for more intensive design time. KitchenSync also offers a full compliment of countertop materials from DuPont Zodiaq, Caesarstone, DuPont Corian, Granite, Marble and Spekva ButcherBlock. Along with the above services, we at KitchenSync are happy to discuss the appropriate choices of other related products and services such as appliances and contractors that are best suited for your particular project.